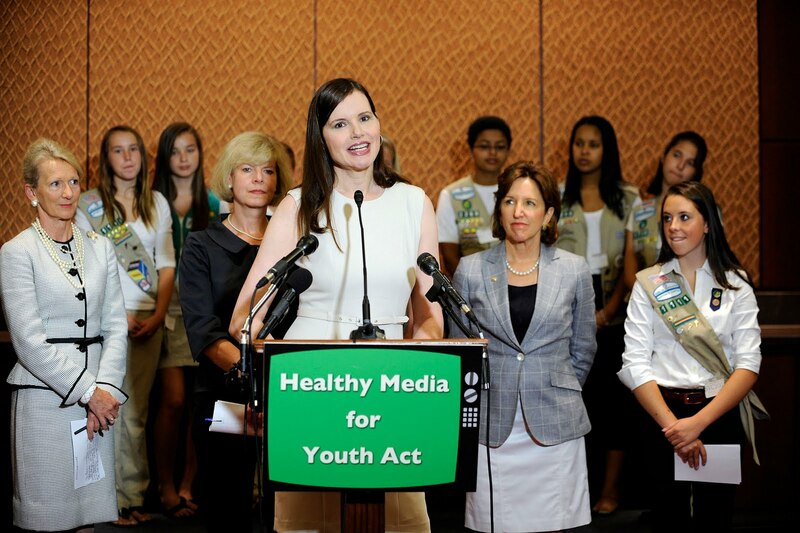 Today Girl Scouts of the USA, Sen. Kay Hagan (D-NC), Congresswoman Tammy Baldwin (D- WI), and Geena Davis, Academy Award winning actor and founder of the Geena Davis Institute on Gender in Media, campaigned in support of the Healthy Media for Youth Act. Joined by teen Girl Scouts, the group outlined the bill, introduced by Hagan and Baldwin, which would improve media literacy for youth and encourage the promotion of healthier media messages about girls and women. “I am pleased to join Congresswoman Baldwin to sponsor the Healthy Media for Youth Act to promote positive media messages about girls and women among our youth,” said Sen. Hagan. “Children today are exposed to upwards of ten hours a day of recreational media. With this bill, Congresswoman Baldwin and Ms. Davis and I want to ensure our kids – both boys and girls - have realistic and healthy views of the role women play in our society as they grow up." “Girl Scouts of the USA thanks Sen. Hagan, Rep. Baldwin, and Geena Davis for joining together to promote positive media literacy and positive images of women and girls,” said Girl Scouts CEO Kathy Cloninger.